How much do you want to be green? 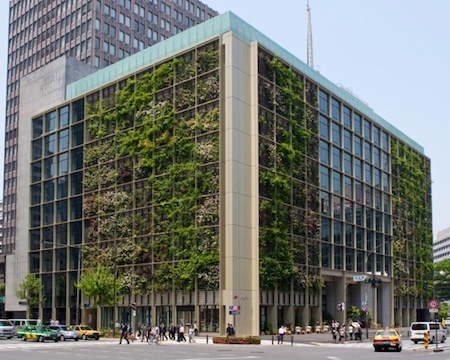 At the offices of Pasona, a Tokyo agency, twenty percent of the space is devoted to growing fresh vegetables and other edible plants. ... the urban farm—the largest in Japan, with a layout that architects around the world should be paying attention to—doesn’t just exist to produce fresh food for Pasona’s employees. With young Japanese citizens giving up agriculture for business in the city, Pasona and its architecture firm, Kono Designs, hope the lush surroundings will inspire urbanites, and give them a newfound appreciation for agriculture. 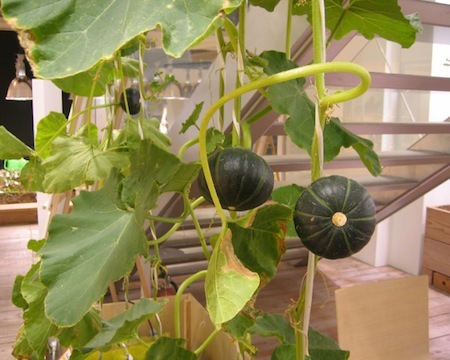 The green areas use a combination of soil-based and hydroponic farming. One of the greatest challenges is balancing the climate needed for growing produce with temperatures that are more comfortable for humans. Some say this is the building’s greatest pitfall, with certain rooms repelling visitors. The main entrance, which sports a rice paddy, is a bit warmer, brighter, and moister than most people would prefer. Workers use a side entrance to avoid it. I was going to use the Chlorella Plantation from Pohl and Kornbluth's 1952 novel The Space Merchants as an early example of an urban farm (which it is). However, take a look at this next photo. Apparently, some of the building spaces are a bit uncomfortable for business-suited humans, because the plants have taken over! I'm trying to think of examples (which I'm sure I've seen) that depict space ships at least partly taken over by plants.